The Ancient Egyptians believed that as long as a pharaoh's name was remembered, the king would live on through eternity. King Tut was a minor King. He died when he was only nineteen years old. But the discovery of the tomb of Tutankhamun and its fabulous wealth has made King Tut one of the most famous Pharaohs. The discovery of the tomb of King Tut has ensured that Tutankhamun is one Egyptian Pharaoh who will never be forgotten. The Golden Age of the Pharaohs. What was the life like for King Tut, the Pharaohs and Ancient Egyptians? Religion, clothes, food, drink, sports, music, education, language, medicine and and culture of the era. Facts and information about all of these subjects and the history timelines of the pharaohs! The King Tut Sitemap provides full details of all of the information and facts provided about the fascinating subject of the Golden ge of the Pharaohs and King Tut! The mystery surrounding the death of King Tut. Was he murdered? If so who would have wanted to kill him? What were their possible motives? Or did King Tut just die from more natural causes? The Suspects - Who killed King Tut? The Motives - what were the possible motives to kill the Pharaoh Tutankhamun, King Tut? The Opportunities - Did the suspects have the opportunities to murder the Pharaoh Tutankhamun? Who succeeded King Tut (Tutankhamun) as the next Pharaoh of Ancient Egypt? The Ancient Egyptians had strong beliefs and many Gods and Goddesses, who numbered nearly 1000. These Gods and Goddesses were often depicted as part animal and apart human with the body of a human and the head of an animal. Details of Egyptian Mythology, the Creation myth, the Cosmogony and the Ennead. This section contains a list and the names of many Egyptian Gods and Goddesses including Aten, Amon, Amen-Ra, Amon-Ra, Anubis, Bast or Bastet, Geb, Hathor, Horus, Isis, Khepera, Khnum, Min, Nephthys, Nut, Osiris, Ptah (Tathenen), Sekhet aka Eye of Ra, Seth aka Set, Shu, Sobek, Tefnut, Thoth. The Ancient Egyptians believed in Divine Kingship. Pharaohs such as King Tut were also believed to be Gods. The Book of the Dead - What did the Book of the Dead contain and why was it important to King Tut? The location of the tomb of King Tut in the Valley of the Kings, the discovery of the tomb, excavation of the tomb of King Tut and its description. The artefacts, the hieroglyphics, the mummy of King Tut - Tutankhamun and the fabulous golden sarcophagus and treasure. The Ancient Egyptians believed in the afterlife. The customs and beliefs of the Ancient Egyptians called for the preservation of the body and extensive provisions for the after-life which were buried with them. The tomb of King Tut reflected these beliefs. The treasures contained in the tomb of King Tut were seen as a continuation of the life of the Pharaoh before his death. The tomb section covers the King Tut Mummy, Tutankhamun Tomb Description, King Tut Sarcophagus, King Tut Mask, King Tut Coffin, Location of the tomb of King Tut, Purpose of King Tut's Tomb, Tutankhamun Tomb Paintings, King Tut Shrines, Content of King Tut's Tomb and the Funeral of Tutankhamun. The myths and legends surrounding the tombs of the Pharaohs and King Tut are legendary and the idea of the Curse of the Pharaohs is fascinating. The section details the curses that surround the Pharaohs of Ancient Egypt, the tombs of the Pharaohs and the rumours of the use of poison in their building, the Egyptian Gods and the people who were reputed to be victims of the Curse of King Tut - Tutankhamun. The life story of Howard Carter and his association with Lord Carnarvon leading to the discovery of the ancient tomb of King Tut in the Valley of the Kings. Howard Carter was an Egyptologist backed by the money of Lord Carnarvon. 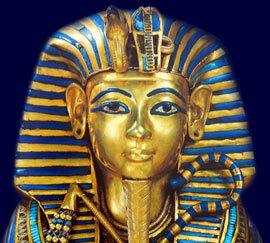 There joint venture led to the discovery of the tomb of King Tut and its fabulous wealth. This section provides useful details of the Ancient Egypt History and the names of all of the known pharaohs who ruled in the Kingdoms, Periods and Dynasties of Egyptian Ancient World. It includes facts, information and details of an Ancient Egyptian Timeline, Ancient Egyptian Dynasties, Predynastic Egypt, Early Dynastic Egypt, Old Kingdom, First Intermediate Period, Middle Kingdom, New Kingdom, Second Intermediate Period, Egyptian Late Period, Ptolemaic Dynasty, Third Intermediate Period, Egyptology and Egyptologists. The Egypt Travel Guide provides information about some of the greatest and most famous places to visit when taking an Egyptian holiday or vacation. Our top ten Egypt travel guide specifies destinations and ancient places of interest to visit on an Egyptian vacation or holiday. Our Egypt travel guide provides facts and information about famous places in Ancient Egypt. A Travel Guide to sites in Lower Egypt including Cairo, Saqqara, Armana and Memphis (North Egypt). A Travel Guide to and ancient sites of Upper Egypt including Luxor, Abydos, Edfu, Aswan, Karnak and Abu Simbel (South Egypt). Egypt, the home of King Tut. The King Tut Exhibit or Exhibition provides a roving display of the fabulous treasures which were found in his tomb. The shining gold sarcophagus and the golden death mask of Tutankhamun capture the imagination and indicates the enormous wealth of the Ancient Egyptians. The Tutankhamun London exhibition rooms includes an introductory film and information based on The Tomb, Ancient Egypt before Tutankhamun, Death, Burial and the Afterlife, Egyptian Religious Revolution, Egyptian Traditional Beliefs, Tutankhamun King of Egypt and Daily Life Facts in Tutankhamuns World. Comprehensive facts and information on all of these subjects can be accessed by our sitemap. But fast facts and info may also be found via links which we hope will 'wet your appetite' for Ancient Egyptian History and the Tutankhamun London Exhibition at the O2. The Valley of the Kings contains 62 Ancient Egyptian tombs where many of the famous Pharaohs of Ancient Egypt, including King Tut, were buried. Ravaged by tomb robbers the most famous of all the Egyptian tombs was that of King Tut - Tutankhamun. There is also facts and information about the Egyptian tombs in the Valley of the Queens where the wives and family of the Ancient Pharaohs were buried. Each section of this King Tut website addresses all topics and provides interesting facts and information about the Golden Age of Pharaohs and of Egypt. The Sitemap provides full details of all of the information and facts provided about the fascinating subject of the Pharaoh King Tut - Tutankhamun! Who Killed King Tut? King Tut Murder?